In the early hours of this morning through their Facebook and Twitter accounts the Eritrean Ministry of Information and Minster Mr Yemane G. Meskel have been giving out information about the arrival of Prime Minster of the Federal Democratic Ethiopia Dr AbiyAhmed and the President of the Republic of Somalia, H.E. Mohamed Abdullahi Mohamed. EriTVs coverage and experts taken indicate that after concluding the FOCAC Summit in Beijing Prime Minster of the Federal Democratic Ethiopia Dr AbiyAhmed and a delegation consisting of Dr Werkeneh Gebeyehu arrived in Eritrea for a two day working visit. 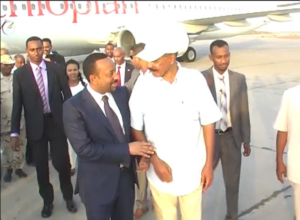 The Prime Minster arrived in the morning hours at Assab and was accorded a warm welcome by President Isaias Afewerki, government officials and army commanders. The two leaders and the delegation took a tour by car to inspect the route from Assab to Bure travelling until the border with Ethiopia (Bure) and concluded the road is in good condition before departing to Massawa. The report also adds there are plans to modernise Assab port as well as to widen the road from Assab to Bure to four lanes. The PM of Ethiopia who is in #Eritrea for a two day working visit along with Assab will also visit, Massawa, & Asmara and will hold extensive talks with President Isaias Afewerki on strengthening the implementation of previous agreements. In relating news the President of the Republic of Somalia, H.E. Mohamed Abdullahi Mohamed, will also arrive in Asmara later in the afternoon for a regional tripartite summit with President Isaias Afwerki and Prime Minister Abiy Ahmed. In similar news a trade vessel owned by Ethiopia has docked in the port of Massawa after winning an auction by the mining company Bisha to ship its zinc minerals. The vessel named Mekele, which has the capacity of transporting 12 thousand tons, will depart Massawa after finishing loading within 20 hours. It is to be recalled that Eritrea and Ethiopia signed a joint agreement ending the state of war between the two countries and opened a new era of peace and friendship, which is based on mutual respect for sovereignty. Thus the vessel, which has docked in port of Massawa after 20 years, is the outcome of the joint declaration. In an interview given to ERINA the general manager and chief officer Mr Dawit Menghisteab briefed that the port of Massawa has been giving service to various large and long trade vessels by overcoming shortcomings constantly working to ensure its competitiveness in the region.